Kelp is a type of brown seaweed high in iodine, protein, calcium and iron. 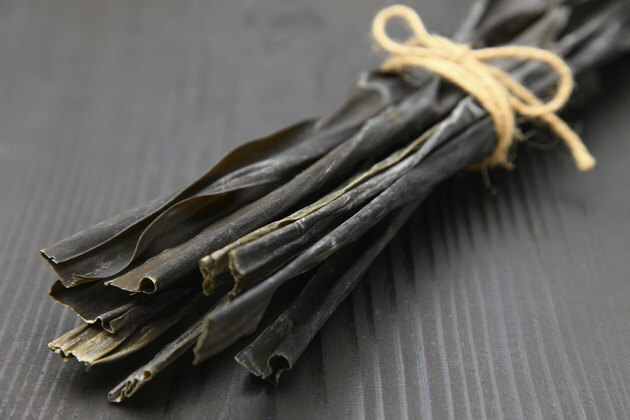 It is commonly sold dried, as kelp will rehydrate quickly with a number of cooking processes. You can either steam, saute or boil dried kelp to serve as a side dish or use in a recipe. About 15 minutes is required to cook dried kelp, no matter which method of cooking you choose. Once cooked, the kelp will keep for up to three days in the refrigerator, but is best used right away. Lay a sheet of parchment paper on the steamer basket to give the kelp a lining on which to cook. Preheat the steamer to high. Place the dried kelp into the steamer basket and cover it. Allow the dried kelp to steam for about 10 minutes. Remove the steamer basket from heat and leave it covered. Allow the steamed kelp to cool in the steamer basket for five minutes. Uncover the basket and use or serve the steamed kelp while hot. Set a small skillet over medium-high heat for two minutes. Add a dime-size drop of sesame oil to the skillet and preheat it for an additional two minutes. Place the dried kelp into the preheated skillet and stir it constantly for about six minutes. When the kelp is done, it should be tender and slightly crispy. Allow the sauteed kelp to cool for five minutes before serving or using in a recipe. Place a large pot half-full of water over high heat. Bring the water to a rolling boil and then add 1/2 tsp. of sesame oil. Add the dried kelp to the boiling water and allow it to cook for about 10 minutes or until it is tender. Remove the boiled kelp from the water carefully and allow it to drain for three minutes on paper towels. Serve or use the boiled kelp while hot. Refrigerate leftover kelp immediately and consume or use it within three days. The Gourmet Cookbook; Ruth Reichl, et al. What Are Kelp Tablets Used for?